You are here: Home / CRICUT PROJECTS / Cricut Explore and Cricut Maker – Crafting Game-Changers! 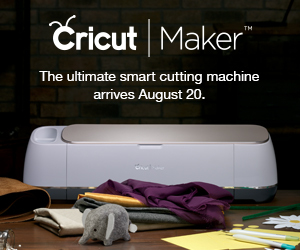 Introducing the Cricut Maker -the newest machine in the Cricut electronic cutting machine line-up. If you aren’t familiar with Cricut cutting machines, these machines are going to amaze you and take your crafting to a whole new level! The Cricut Maker cuts over 100 different materials, as do all of the Cricut machines, but with cleaner more precise cuts than ever before. The secret is a revolutionary rotary cutting blade which makes cutting fabrics (hello sewers and quilters) super precise–it even marks seams, etc. I’ve included some short super-informative videos for you to actually see some of what is capable with this machine! This machine is amazing. My friend Angie Holden from The Country Chic Cottage made this video showing you the cutting capabilities of the Cricut Maker! This machine literally blows me away! I know how much of a game changer the Explore was for my crafting business and I am definitely putting the Cricut Maker on my wishlist for Christmas this year! Cricut Explore is the first electronic cutting machine Cricut introduced in what is now a “group” of electronic cutting machines–the Cricut Explore, Cricut Explore Air, Cricut Explore Air 2 (and, of course, the newest and BEST machine the Cricut Maker -featured above)! The Explore was the first model however, Cricut has been very busy over the last few years and the machines have gotten better, faster, quieter and even wireless! If I were to purchase an “Explore” machine today, I would buy the Cricut Explore Air 2 ! However, now that the Maker is available I would definitely purchase it over the others. The Explore line is great, but the Maker is exceptional. The Explore Air 2 (pictured below) is a great value and does a great job creating beautiful, professional quality projects! All of the Cricut electronic cutting machines are capable of cutting a multitude of materials including vinyl, paper, vellum, card stock, balsa wood, leather, felt, fabrics and literally dozens of other materials. You can see a very small sampling of what these machines can do below, but if you really want a clear picture of the Cricut Explore Air 2 and Cricut Maker visit the Cricut website – you will absolutely be amazed! Vinyl Decals, Appliques for t-shirts, hats, pillows etc, Invitations and cards of all kinds, Party Decorations and Necessities, Signs of all kinds, Flowers, Wreaths, Furniture Customization, Wedding Decor & Accessories, Decorations for every holiday, Organize your home with labels, Stencils, Personalized Hand-made gifts-the possibilities are as vast as your imagination! Design Space is Cricut’s web-based site where you design your own projects or upload your own SVG cutting files from your computer. Design Space has a huge selection of “Make It Now” projects as well! There’s also print and cut option that allows you to upload an image to Design space and print it on your computer and then cut on the Cricut, There’s even an app for your tablet or your smart phone! Creating on the go just got a whole lot easier! You also have access to pre-designed projects from the “Make It Now” collection (which are customizable too). Here’s a very small sampling of projects available to you–and they add more all the time! Cricut’s website is full of helpful information including project ideas, tutorials, instructional videos and more. Cricut has its own YouTube Channel where they provide detailed tutorials on how to set up and use their machines. There are videos of everything you need to know. Plus, they have great phone and chat support, with the nicest, most patient and helpful support staff I have ever had the pleasure of speaking to. Cricut machines aren’t just for scrapbooking and paper crafts and, although they do a fabulous job for those projects, they capable of so much more. I have created all the decorations for bridal showers, weddings and baby showers- including programs fans, menus, banners, signs, invitations. I have created beautiful signs made with stencils as gifts as well as for sale created on my Cricut. You can organize your home with labels, decorate and make gifts for holidays and celebrations, create artwork and much more! Here are a few of my Cricut projects! The Cricut Maker is hands down the best money you will ever spend on a crafting tool. The incredible amount of projects in the “Make It Now” section along with the ability to create your own designs or upload purchased SVG files makes creating beautiful crafts, gifts, home decor, cards, and decorations of all kinds and sewing/fabric projects fast and easy with professional results. There just aren’t any another machines out there capable of what these machines can do. If I were purchasing for the very first time, I would absolutely purchase the Cricut Maker and hope to have one on my craft table very soon! I would love to answer any questions you may have! Please feel free to get in touch with me via The Nested Design Company’s Facebook page at https://www.facebook.com/nesteddesigncompany or email me at karen@nesteddesigncompany.com or leave your questions in the comments below. « Repurpose a Mirror (or Ugly Artwork) with Paper!